I met Mireia for some impressive photos of a respected cesarean at "Matter Training"s blog, and was impossible not entering at her website to see better her work. Just looking at a couple of photos, I already knew I wanted her to capture my first pregnancy and the first days of little Eira. I am really happy and grateful with the sessions, where the calm, the illusion and the patience that Mireia transmits made possible to get some amazing pictures where it seems that it can feel the happiness that I felt with my belly, the wonderful smell that babies have the first days, the softness of my baby skin or enjoy of the complicity that our dog Neula was feeling. One thousand thank yous Mireia, for the professionalism of the results and the way you treated us. I will repeat for sure! For me it was a luxury to have this episode of our lives captured in such precious images and done with such sensitivity, delicacy and discretion. As time goes by, the more I realize this will be a present for life, to our daughters. If they ever become mothers they will have the chance to not only know that their mother also conceived and gave birth, but actually see it and experience it through images. Mireia Navarro will be always part of our history, thank you for the work you do. Unforgettable experience. 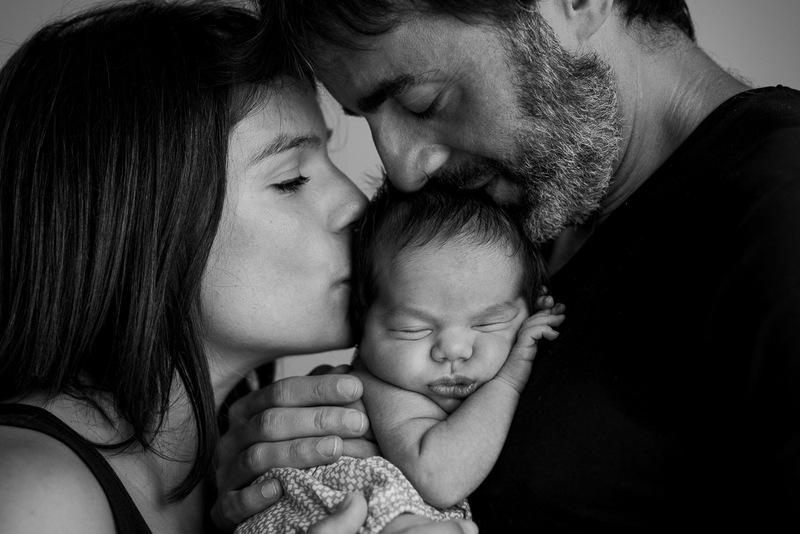 We are parents of three girls and Mireia's session was great. She has a lot of experience with newborns and you really notice how the girls were very relaxed during the session, resulting in us, the parents, being able to relax as well. And the photos, couldn't be better. I recommend it to everyone!. Wow Mireia, we are so amazed by the photos and crying !!! The photos you took are so precious, they transmit everything we felt at that time. We are very fortunate to have had you with us to capture these moments. I know it must be very difficult, hard and exhausting accompany someone for so many hours, but you make it look easy and you were part of the family giving warmth, encouragement, conversation and affection. You know how to accompany childbirth, knowing where to be and how to act at all times. You have a gift and the birth of Marçal wouldn't be the same without you. With your pictures we can relive a unique moment in our lives. These photographs are an invaluable legacy for our family, especially for the protagonist, our son. Many, many thanks. I will not get tired of saying it. You have shared with our small family so many magical moments, always with a smile and excellent service. Gorgeous photos that will be a part of our lives forever. Thanks Mireia. Thank you for a beautiful morning yesterday! The hospitality of your family and the experience of seeing our baby in these pretty pictures was something to remember forever. Thanks, Mireia! We are crazy for these photos, so beautiful! Mireia is a courageous, a fighter and above all a dreamer. She’s able to see the beauty that is in everything and the best part is that she is able to capture it and share it in her photographs. A luxury to be in Mireia’s hands to catch and preserve forever the images of our loved ones. En un any hem vist que l'Anaïs ha crescut molt, i molt ràpid. Quan vam fer els retrats representaven unes imatges precioses de l'Anaïs. Però ara el seu significat ha canviat, són records d'uns moments efímers.